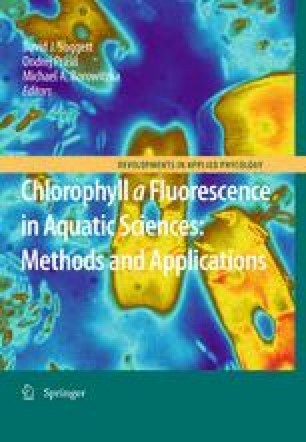 This chapter investigates the use of chlorophyll a fluorescence to better understand changes in the regulation of photosynthetic electron transport. It describes the different electron pathways utilised by photosynthetic organisms, including pathways used in photosynthesis as well as alternative electron cycling (AEC). The major photoprotective processes are described, in particular, non-photochemical quenching (NPQ) and its three components, energy-dependent quenching (qE), state-transition quenching (qT), and photoinhibition (qI). Fluorescence and NPQ responses to light stress are compared across a higher plant, diatom and cyanobacteria. Photosynthesis is a complex interaction of complementary processes making the identification and isolation of a particular photosynthetic pathway or process inherently difficult. Therefore, we describe the use of chemicals which allow for the differentiation of mechanistic photosynthetic processes, such as electron transport pathways, CO2 fixation and the use of trans-thylakoid proton gradients, which can be effectively understood and quantified using chlorophyll fluorescence detection techniques. PR thanks the Australian Research Council for financial support. CW and TJ thank the Deutsche Forschungsgemeinschaft for financial support Wi 764/12. JL thanks the Centre National de la Recherche Scientifique (CNRS), the Agence Nationale de la Recherche (ANR program VasiRéMi) and the Deutsche Forschungsgemeinschaft (DFG, grant LA2368/2-1) for their financial support. Ross Hill is thanked for editorial comments.